The fight against Earth's oceans is almost as old as humankind. Through millennia, humans have battled typhoons and waves as high as buildings. "To sail is necessary, to live is not necessary," said Plutarch during a huge storm in the Mediterranean. Here are 18 photos that perfectly illustrate that idea. 1911: wrecked steamer fights the rough seas. Ship 'Endurance' in the ice, 1915. On board the ship `Garthsnaid' at sea, 1920, showing sailors securing a section of the foresail which had come free from the gaskets in heavy weather. Europa, one of the fastest liners in the Atlantic service, arrived in New York City on Dec. 11, 1931 approximately 24 hours behind schedule because of the unusually heavy weather in the Atlantic Ocean. Aboard the german cargo ship MS Sabine Howaldt, during a North Atlantic winter storm, 1958. A Sailor makes his way up the brow aboard the Military Sealift Command (MSC) fleet ocean tug USNS Apache (T-ATF 172) during a rare snow storm on board Naval Amphibious Base (NAB) Little Creek, Va., Feb. 3, 2005. The cargo ship Porvenir I is seen during violent winds that caused strong swells on the coasts of Chile, on Aug. 3, 2005. Three crew members could not be rescued after falling overboard. Lightning storms rage over the flight deck of Nimitz-class aircraft carrier USS John C. Stennis (CVN 74) as the ship transits the Persian Gulf, March 28, 2007. The Russian-owned "Vera Voloshina" cargo ship is seen after running aground during a heavy storm, near the Black Sea resort of Sudak, Ukraine, Sunday, Nov. 11, 2007. Flight deck personnel aboard the multipurpose amphibious assault ship USS Iwo Jima (LHD 7) work night operations as thunderstorms approaches (Sept. 9, 2010). HMNZS Wellington, offshore patrol vessel (OPV) encounters rough seas in Ross Sea, on February 22, 2011. Sailors prepare an F/A-18F Super Hornet for launch as the Nimitz-class aircraft carrier USS Carl Vinson (CVN 70) passes through a storm front on the Arabian Sea, Jan. 21, 2012. The Nimitz-class aircraft carrier USS Carl Vinson (CVN 70) passes through a sand storm on the Arabian Sea, on March 19, 2012. 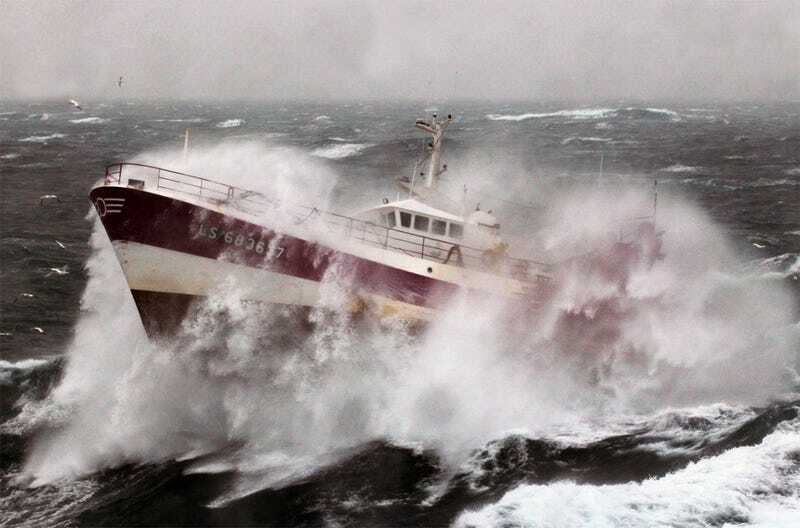 2013: The French Fishing vessel Alf during a storm in the Irish Sea. USS Donald Cook (DDG 75), an Arleigh Burke-class guided-missile destroyer transits the Black Sea through heavy blizzard, on Jan. 7, 2015. This two side-to-side videos showing the outside and inside of a cargo ship are so good. Here's another cargo ship bending.